I am quite popular in England, but my breed is still relatively rare in the United States. I look a little like my friend, the Pembroke Welch Corgi, and we share some of the same talents: cattle driver, watchdog, and farmhand. I am an active, eager-to-please type with a spontaneous personality. My coat is easily maintained, requiring only regular brushing and an occasional bath to keep it nice. When fully grown, I am between 13 and 16 inches tall (33 to 40.6 centimeters) and I weigh between 20 and 32 pounds (9 to 14.4 kilograms). 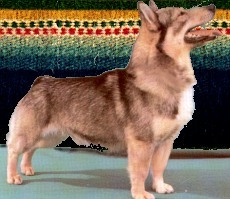 We have no Swedish Vallhund Breeders listed at this time. Click here to place your Swedish Vallhund Ad!